Saved from extinction by cheese? Well, it is true of Swedish Landrace Goats, who were nearly extinct when farmers discovered a demand for cheese made of their milk! Swedish Landrace Goats have been used as dairy goats for centuries. They are good grazers and adapt well to most management systems. Swedish Landrace Goats tend to be hardy and well adapted to their climate. With their long coats they can withstand cold weather. At maturity, Swedish Landrace bucks stand around 75 centimeters at the shoulder and weigh approximately 70 kilograms. Does stand around 65 centimeters and weigh around 40 kilograms. Available in a variety of colors, Swedish Landrace Goats offer farmers an interesting choice! They may be solid white or solid black, or of variegated brown, black or gray coloring! The hair is usually quite long on Swedish Landrace Goats. They are available in polled or horned varieties, and are good milk producers. Swedish Landrace Goats average about 700 kilograms of milk each year. The milk tends to be quite high in fat and protein percentages, the characteristic of good cheese-making milk. Swedish Landrace Goats are indigenous to Sweden, as their name would imply. In Sweden, they are known as Svensk Lantras Goats. They have had genetic introgression from Norwegian Landrace Goats, to whom they are very closely related. Today, Swedish Landrace Goats are found mainly in Sweden’s northern regions. Their population was on a steady decline, but several years ago farmers who persisted in breeding Swedish Landrace Goats discovered a market for their cheese! Today, cheese making remains a viable option for those wishing to raise Swedish Landrace Goats and may very well save the breed from extinction! Swedish Landrace Goats thrive when housed for the harshest two to six months of each year and offered mixed feed. 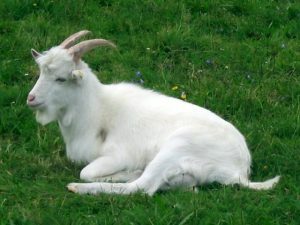 Compared to the Saanen Goat, Swedish Landrace Goats have average lengths of lambing intervals and mating seasons. They also have comparable ages at sexual maturity, litter sizes and milk yields. Because they are becoming scarce, Swedish Landrace Goats should be bred responsibly. Artificial insemination programs are available to help with this.